Click HERE to listen & watch the score with SCOREPLAY. 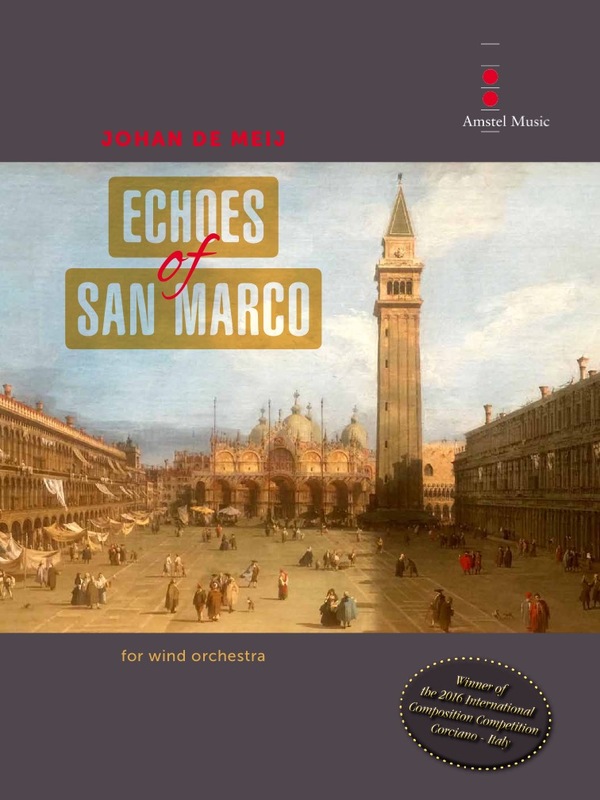 Echoes of San Marco was composed as homage to Italian composer Giovanni Gabrieli (1554 – 1612), the renaissance maestro who was well known for his use of double wind ensembles, mirroring each other sonically in the awe-inspiring San Marco Cathedral in Venice, Italy. Majestic brass fanfares from two different locations in the back of the concert hall mark the opening of the work: we hear fragments from Giovanni Gabrieli’s majestic Canzon Septimi Toni a 8 from the Sacrae Symphoniae (1597), originally written for two four-part brass choirs. Several groups within the orchestra, such as a double-reed choir, a saxophone quartet, a horn quartet, euphonium/tuba quartet and two sets of tubular bells mimic the brass choirs, while the clarinet choir and a flute quartet prolong the echoes with mysterious cluster chords. New thematic material is developed out of one of the bass lines of the opening section, quoting a four-note motif C-A-D-G. The work reaches a triumphant conclusion with a grand hymn. “Echoes of San Marco” is the winner of the 30th Edition of the International Composition Competition in Corciano – Italy. The Jury praised the work for its ‘highly original writing and inventive orchestrations’. It is the fourth time that De Meij has been awarded in this prestigious competition. In 1995, he received the honourable mention for his Symphony No. 2 “The Big Apple”. In 1999, he took1st prize for his cello concerto “Casanova”. He was awarded 2nd prize for Symphony No. 3 “Planet Earth” in 2006. Echoes of San Marco was commissioned by Col. Larry H. Lang, Commander of the United States Air Force Band to commemorate its 75th Anniversary in 2016. The two brass quartets need to be placed in the back of the hall in the two corners, ideally on a balcony if there is one. The horn quartet and saxophone quartet can be placed backstage left and right, or on a front balcony, depending on the venue. Echoes of San Marco would work wonderful in a church or cathedral with rich acoustics, to emphasize the echo effects throughout the work.